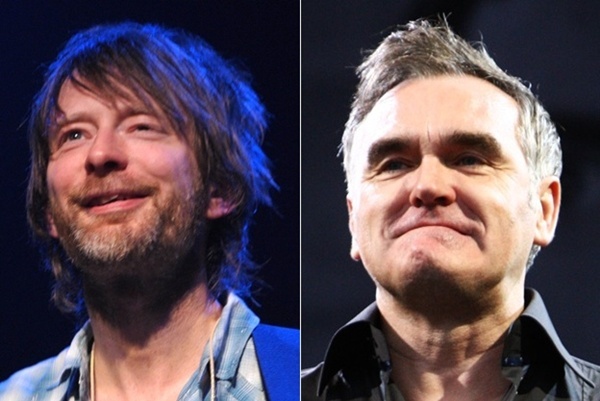 Rock Court: Which band's music is more harmful for your children, Radiohead or the Smiths? Rock Court: Which band’s music is more harmful for your children, Radiohead or the Smiths? Both gods of modern rock, both capable of causing night terrors. Any music fan with a shred of self-respect is going to have an opinion about what they consider to be required listening for their children. Pity that two of the biggest bands in modern rock history should probably be left out of the conversation. As a whole, the modern rock landscape is actually very family-friendly. Regardless of the instrumentation, the genre has largely favored bands with strong pop sensibilities, and anyone with children knows that kids like to dance around the house, so if your song has a beat, odds are good that kids are going to like you. At the same time, there are certain bands that, for the sake of their emotional development, should be put on hold for a few years. Take the Smiths, for example. They wrote some very danceable, up-tempo songs, but the next time your kid sings “Sweetness, I was only joking when I said I’d like to smash every tooth in your head” at a sleepover, it will result in 100% fewer sleepover invitations, among other things. Having said that, we would argue that there is another band, a newer and much ‘cooler’ band that is far more detrimental to your child’s emotional development, and that is Radiohead. Critical darlings though they may be, they are a temper tantrum in a jewel case, a meltdown on MP3. If you give a kid paper and crayons and ask them to draw while OK Computer is playing, you will get nothing but pictures of storm clouds and dead unicorns. Which band, then, is capable of inflicting the most emotional damage? This is where you come in. Below we have made what we believe are persuasive arguments for and against each band in terms of the potential impact that prolonged exposure to their music will have on children. Please weigh each argument carefully, and vote for which band you think poses the bigger threat to a child’s well being. Pros: The perfect marriage of ‘indie’ and ‘pop.’ Uncanny sense of rhythm and melody. Penned some of the wittiest lyrics in rock history. Loved the juxtaposition of the ridiculous (“I booked myself in at the Y… W.C.A.”) with the sublime (big choruses, unforgettable guitar riffs). Cons: Lyrical content often wildly inappropriate (drinking, masochism, death), talk of liquid gender roles might confuse children. Lead singer Morrissey often bordered on self-parody. Fans of their music often suffer from low self-esteem, and are subject to wild mood swings. Pros: Often imitated but never duplicated, there isn’t another band on the planet quite like them. Fearless, innovative and fiercely independent, they have little regard for their commercial prospects, and as a result they have shattered virtually all conventional notions of success. Cons: Obtuse. Increasingly allergic to melody and major chords. Lyrical content an enigma to everyone but singer Thom Yorke. Even their biggest hits are emotional mine fields. Fans of their music are largely intolerant of so-called lesser acts, and have absolutely no sense of humor about the band’s shortcomings. The prosecution and defense rest, your honor. The rest is up to you. Which band's music is more harmful for your children? Note: Popdose loves both Radiohead and the Smiths, and this piece was written purely in good fun. If you are offended by it in any way, you are clearly a Radiohead fan.